Vibrant Construction Equipments Private Limited began its journey of incandescent growth in 2013 by manufacturing exceptional range of Road Construction Equipments. Owing to high durability, superior finishing, dimensional accuracy and longevity, these products are heavily demanded in the market. Due to these aspects, we have been able to surpass our competitors in terms of quality, innovative technology and ethical business skills. We have developed leading edge infrastructure system for fabricating our wide range of products with maximum perfection. We have implemented advanced production lines for manufacturing of these products by using modernistic machines of CNC operated processes. On top of that, we have developed quality testing unit for inspection of these products under strict quality control parameters.With use of skilled designers, we design these products in various stipulations as per latest industrial standards for serving diverse needs of clients. Our veritable goal of attaining maximum clients' satisfaction have gathered us vast customer base to serve globally. Under the adroit management of Mr. Kranthi Kumar Ravuri, we have achieved remarkable success rate in this field. Our officers' prime goal of attaining utmost clients satisfaction by providing quality products have established us as most accomplished firm in the market. Since our commencement, we employ team of conscientious professional who have wide prowess of this field. Our team comprises of adept designer, production engineer, quality controller, management professional and other subordinates. For ensuring manufacturing of products to be carried out as per clients'''' laid specifications, our team works in close vicinity and co-ordination with each other. Our company is able to serve diverse demands through our efficient management personnel. 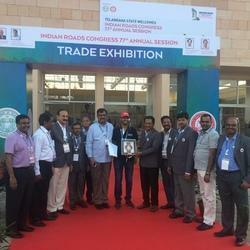 Vibrant has participated in Indian Road Congress 77th Annual Session,from 15-18th dec 2016 at Hitex ground in Hyderabad T.s India. 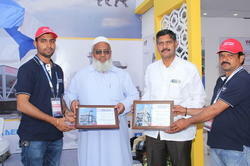 During which Vibrant has been awarded a token of appreciation by Mr. K.Radha Krishna Superintending Engineer, R&B Chairman,Technical Exhibition Committee and Mr.P.Ravinder Rao Engineer-In- Chief, R&B Member Steering Committee. To continue with our aim of obtaining client satisfaction, we have setup most advance infrastructure that operates in accordance with the latest technology. The layout and installation of every system, including manufacturing, warehouse, packaging and distribution is setup keeping in mind the quality as major focus and it is also updated within regular time intervals to engage productivity balance with the progress. Due to our client oriented approach, we are intensely focused towards quality production and maintaining long term business relationship with our clients. Our firm is reputed for efficient rendering of different products in accordance with customers'''' laid specifications. Quality of our products is our uttermost priority and this is employed at every step from production till their delivery. Vibrant has participated in Builder's Association of India (BAI) XXVII All India Builder's Convention at Hyderabad from 8-10 Jan 2016. 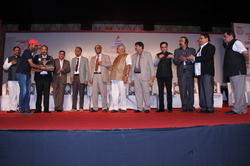 During this Vibrant has been awarded by BAI.